The UO Campus Shuttle is back for another year, and with a new "UO Rides" feature on the official UOregon App, finding a safe ride to or from campus is now easier than finding the Duck on the Autzen Stadium sidelines. 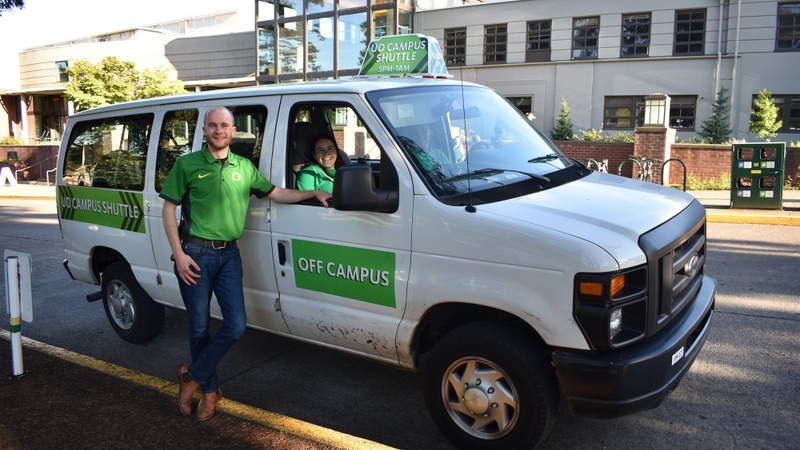 The UO Campus Shuttle, a fixed-route van service operated by the UO, debuted last January, running through the end of the academic year. It provided more than 10,000 rides in those six months, complementing the call-ahead services from Safe Ride and the Designated Driver Shuttle. The shuttle is back in 2018-19 with a streamlined route, operating seven days per week, 6 p.m.-1 a.m. in fall and winter, 8 p.m.-1 a.m. in spring. Of course, ride-hailing services are operating in Eugene and serving campus. And students still ride Lane Transit District buses for free with UO ID, including the rapid-transit EmX line that runs by campus and to downtown Eugene. Students also should remember to register their bikes as soon as possible, and PeaceHealth Rides bike share offers an easy, healthy option for those who don’t have a bike on campus. The Access Shuttle from UO Parking and Transportation is ready to help anyone with mobility challenges, including temporary ones. A whole range of transportation options are available. 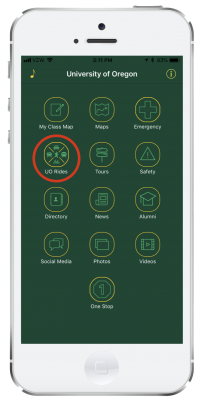 Keeping the options in line is simple with the new UO Rides tab on the free UOregon mobile app, which is available on the iTunes store and Google Play.